by David J. Halberg, Esq. The ongoing scourge of medical malpractice in Florida is reason the state legislature and health care professionals established the Peer Review process, as outlined in F.S. 395.0193. It’s a means of identifying potential problem areas for individual physicians by having colleagues review their work, with the stated goal being improvement of patient care and reduction in medical and legal expenses. However, one of the aspects of the peer review process, per section 8 of that statute, is that the investigations, proceedings and records of the peer review panel, a committee of a hospital board, disciplinary board, government board or agent of one of these “shall not be subject to discovery or introduction into evidence in any civil or administrative action against a provider of professional health services arising out of the matters which are the subject of evaluation and review…” In other words, if you file a medical malpractice lawsuit against a Florida doctor, the records contained in these peer review files – even if relevant – can’t be compelled. However, records pertaining to these cases from independent sources aren’t immune from discovery just because they were presented in peer review proceedings. It can be frustrating as a patient who suffered a missed diagnosis, misdiagnosis or other medical error to know there are records that could help your case that you can’t use. However, as a recent case before the Pennsylvania Supreme Court revealed, this immunity may not extend to each and all circumstances. Pennsylvania has a similar peer review process and statutory immunity to protect information gleaned in these proceedings. However, in Reginelli v. Boggs, the court held that the performance file developed by an independent contractor (one that provided staffing and administrative services for a hospital emergency room) were not protected under the state’s peer review statute. The statute provides narrow evidentiary privilege to protect documents and proceedings of the peer review committee examining activities of health care providers in conformity with its provisions. Here, plaintiff in a medical malpractice lawsuit sought information after an alleged missed diagnosis of a heart condition while she was in the emergency room led to her discharge – and heart attack days later. She filed a medial malpractice action against the the emergency room doctor for his treatment, as well as corporate negligence against the hospital (alleging failure to train and supervise staff or develop adequate policies). She also filed claims of vicarious liability against the hospital and staffing agency (which was the employer of the E.R. doctor). Her husband sought damages for loss of consortium. In depositions, it was learned the staffing agency kept and maintained a performance file on the doctor in question as part of regular practice of reviewing randomly-selected charts of patients treated by this physician and others. Plaintiff sought discovery of that performance file. Defense objected on grounds it was protected by the state’s peer review statute because the records were created and used for purposes of reviewing services rendered at the hospital emergency room and in other departments. 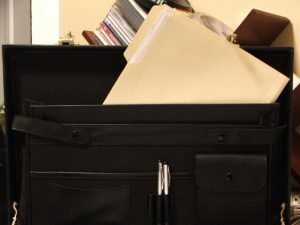 Trial court granted plaintiff’s motion, finding that documents should remain confidential and not copied or reproduced and any information not relevant should be returned to defendant. The doctor and his employer filed a protective order, saying that while the hospital has its own peer review committee, the staffing agency’s separate “outside” peer review was also protected. The court ruled the hospital could not claim privilege for documents it neither generated nor maintained. On appeal, the hospital reiterated that information contained in this doctor’s review file is exactly the type of information that is protected from disclosure by the peer review statute, and the privilege wasn’t waived just because the doctor was an employee of this staffing agency didn’t exclude him from being part of the “medical staff,” albeit in the form of an independent contractor. The immunity privileges should equally apply to independent contractors, defense argued. Still, the appellate court and later the state supreme court affirmed the order to compel this information at discovery. Both courts noted that the staffing agency, as an independent contractor, is not entitled to the protections spelled out in the peer review privilege statute. Further, the courts held that even if the staffing agency’s reviews were entitled to privilege, that was destroyed when those records were shared with the hospital. This is not to say plaintiffs in Florida – even in the exact same situation – should expect this exact outcome. But what this development does underscore is the need for an experienced Fort Myers medical malpractice attorney who will explore every possible avenue of information to help bolster your case. Contact the South Florida medical malpractice attorneys at Halberg & Fogg PLLC., Attorneys at Law, by calling toll-free at 1-877-425-2374. Serving West Palm Beach, Miami, Tampa, Orlando and Fort Myers/ Naples. There is no fee unless you win.